The 2017 release of the Sony RX0 didn’t create too much buzz, even though it was a tiny stills-and-video camera that could well have given any video or action camera a run for its money. While it had some impressive specs – a 1.0-inch 15.6MP stacked image sensor, Sony's BIONZ X image processor and a wide-angle Zeiss-branded Tessar T* 24mm f/4 fixed lens – that apparently wasn’t enough to attract action cam fans drawn to the likes of GoPro's range. You could capture 4K video of course, but not internally – you could only record it via HDMI to an external recorder. That, however, hasn’t stopped Sony from having another crack at high-end all-purpose cams, with the RX0 II the result. 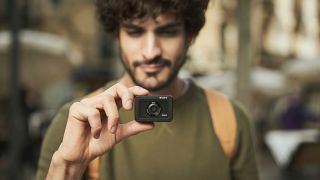 It may resemble a small GoPro, but Sony’s hoping to appeal to more than just the Point Break/action camera crowd with the RX0 II, adding features perfect for vlogging and travel photography. This second iteration looks almost identical to the original RX0 with one small change – it’s thicker, because this time there’s a tiny articulating screen to help you frame your stills and videos better. Despite the additional feature, the RX0 II is, Sony claims, the world’s smallest and lightest premium ultra-compact cam. The RX0 II uses the same lens as its predecessor, and also takes the same battery and shares the same ports. It’s also waterproof up to 10m deep, dustproof, shockproof and crushproof at up to 200kg of force – in other words, this tiny 2.32 x 1.59 x 1.37 inches (59 x 40.5 x 35 mm) camera weighing 4.65 ounces (132g) really is built for any situation. It captures 4K footage and can shoot stills with different creative styles and picture effects, and both modes are now much easier to use thanks to the tiny integrated flip screen. The waterproof LCD panel can be titled 180 degrees upwards for selfies and vlogging, while it's also able to tilt 90 degrees downwards in case you need to hold it up high for overhead capture. Sony’s excellent Eye Autofocus has also found its way to the RX0 II, and it’s even been given a little upgrade. Sony has improved the speed, accuracy and operation of the Eye AF feature, making it quicker and easier to capture people – all it takes is a half shutter press and the focus point will (theoretically) lock on to the eye of the subject. Users can select which eye they want to focus on as well, with selection (left, right or auto) available in the menu system or assigned to a customizable button. Inside the little body is a 1-inch stacked 15.3MP Exmor RS image sensor alongside Sony’s BIONZ X engine that's now capable of recording 4K video internally with full pixel readout. The RX0 II is also capable of recording Super Slow Motion video at up to 1,000 frames per second (previously 960fps in the RX0), while the Zeiss 24mm f/4 fixed wide-angle lens can focus as close as 20cm (7.87 inches) away from a subject. ISO sensitivity is between 80 and 12800, and Sony has added in-body stabilization in this second iteration to eliminate motion blur. Like the original, the RX0 II is also equipped with an Anti-Distortion Shutter that can shoot as fast as 1/32,000 sec, with burst shooting capability up to 16fps. When the RX0 launched a couple of years ago, Sony included the ability to link multiple units together for wireless control. A similar feature is available at launch for the RX0 II, with simultaneous wireless control for up to five of them while using the Imaging Edge Mobile app. Sony says it plans to expand wireless control to cover up to 50 RX0 II units using an access point, allowing for creativity during a shoot, but this capability won't arrive for a few more months yet – it's expected to land around June-July. The RX0 II is also compatible with Sony’s Camera Control Box (CCB-WD1) which will enable a wired setup of up to 100 cameras. The RX0 II will be available in the US and Australia from April 2019 priced at $698 / AU$949. A kit including the VCT-SGR1 Shooting Grip and bracket (which was available with the original RX0 as well) will become available from June 2019, with pricing to be confirmed. UK pricing is set to be around £730, but it looks like it will only be available with the VCT-SGR1 Shooting Grip and bracket.